Having easy access to your charcoal is essential if you want to keep the grilling process simple and enjoyable. 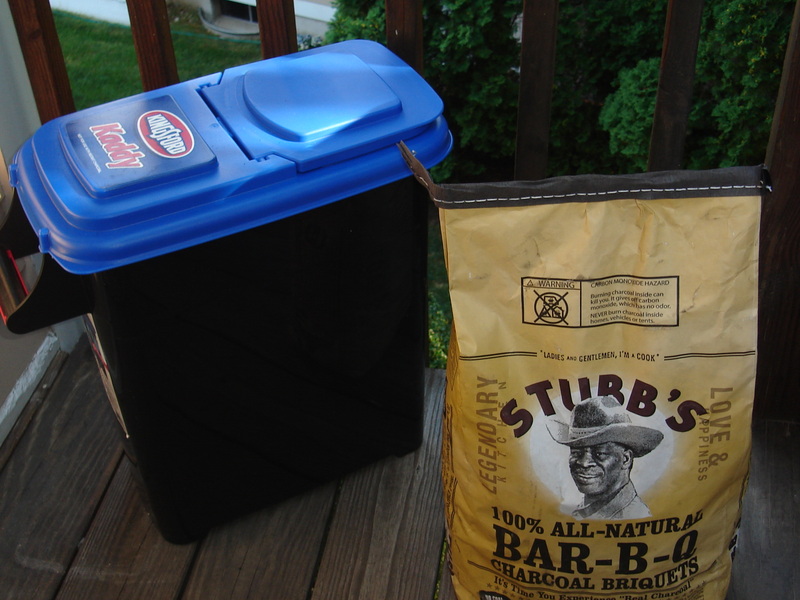 Kingsford makes a storage container that is ideal for this purpose. You merely open one end of the bag, place the bag in the container. and put the top back on the container. Now you have a watertight container that can be stored outside with your grill. No mess in the house and easy access at grill time. What could be simpler ? While everyone at sometime has had a grilling disaster, don’t fear the grill. With a couple of tips, every grilling experience can be enjoyable. First, whether you choose gas or charcoal, make sure your grill grate is clean and well oiled. Every hardware store has multiple types of grill brushes. Whichever type you choose, just remember to use it every time before you cook. I like to wait until the grill grate is hot and has loosened any residual char from the last meal to make this task easier. Also, if you clean the grate after every use there should be very little to clean before the next use. Next, always oil the grate before use. The easiest way to do this is to use tongs and a rolled up paper towel dipped in a cooking oil. I like to use canola oil as it has a high burn point. A couple of swipes across the grate and you’re ready to go. Now that you’re ready to grill you need to decide the grilling method to use – either direct, or indirect. For direct, if gas use all burners..if charcoal, spread briquets evenly. Use this method for searing and quick cooking (steaks,hotdogs..). For indirect, use burners on only one side, or move charcoal to one side. On the unlit side, place a grill pan with a little water. This will help steam as well as catch any drippings to keep the grill clean. Use this method for longer cooking times (chicken). For most recipes, you will use high heat. The easy way to test is to hold your palm over the grill for 3 comfortable seconds. When you can do that, the grill is ready. Next, make sure you have a watch that you can use to time your cooking and keep notes on the type of food grilled, thickness of the cut,time grilled and outcome (rare,medium,well done). By following these grilling basics, you will soon be the Master of your grill !